Our Commercial Sparkle Magic Laser Lights are designed to be a durable lighting solution for both commercial and non-commercial applications. It’s high quality, all aluminum design makes it the light of choice for L.A. Zoo Lights, Tampa's Lowry Zoo Christmas Light Display, Desert Botanical Garden, San Antonio River Walk's Holiday Lights, San Antonio Zoo Lights, many Six Flags Parks. Our Commercial Sparkle Magic Laser Lights Come with a focus cap to narrow your beam of lasers on to a specific area, avoiding overspray. Our light is also weather resistant, allowing for year round use. 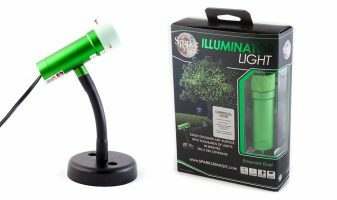 The Commercial Sparkle Magic Laser Light is available in 3 vibrant colors (Red, Green, and Blue) Each unit includes both a Metal Base and 5 inch Metal Stake.